The Voice is set to launch on Monday, April 24, at 7.30pm on Nine. Season Six of the award-winning entertainment blockbuster will premiere over three huge nights on Monday, April 24, Tuesday, April 25, and Wednesday, April 26, with one of the biggest coaching lineups in Voice history. New Coach Kelly Rowland hails from one of the most successful girl bands on the planet, Destiny’s Child with Beyoncé. A five-time Grammy Award winner, celebrated singer, songwriter and author, she is a multi-platinum-selling artist who has toured the globe extensively. “I am so excited for Australia to see this series of The Voice. I have had such a great time working with Seal, George and the beautiful Delta, and we have experienced some really special moments,” Kelly said. Kelly Rowland is joined by one of the world’s most influential artists, Boy George, another Grammy winner whose career spans more than 30 years. He has accumulated worldwide sales in excess of 150 million albums and singles with Culture Club and as a solo artist in his own right. As well as being a vocalist, he is a producer, author, DJ and frontman. 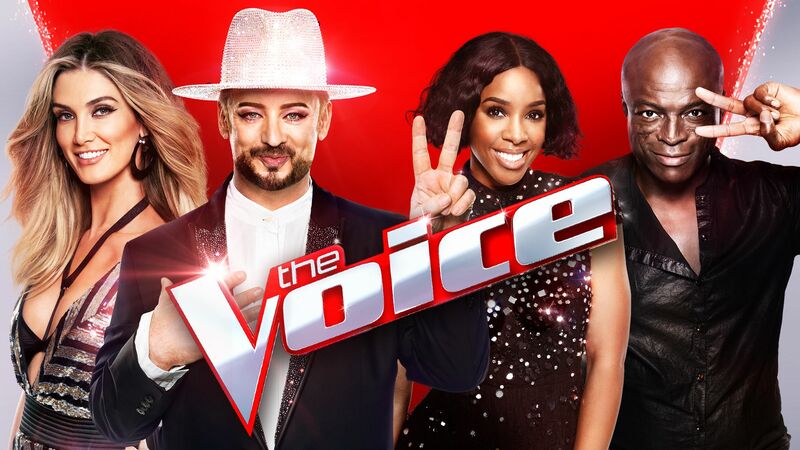 Kelly Rowland and Boy George join previous champions of the big red chair, internationally renowned singing sensation Seal and Australia’s sweetheart and reigning champion Delta Goodrem, as Coaches to bring Australia the most exciting season of The Voice yet. This season The Voice producers have mounted the biggest talent search in the show’s history, reaching into the farthest corners of Australia. Thousands of people from all walks and stages of life auditioned before the list was cut to the lucky 100 who made it to the Blind Auditions. BLIND AUDITIONS: Here we meet the hopefuls of Season Six who will audition for our Coaches in the hope of turning a chair. KNOCKOUTS: Artists go head-to-head in groups of three as they perform a song their Coach has chosen within a theme. There are two thrilling “steals” per Coach up for grabs this season. BATTLES: In the toughest round of this season, two artists go into battle with no “steals” available for the Coaches. Only three from each team will make it into the LIVE Shows. LIVE SHOWS: This season will see a new format with fewer artists making it to the Live Shows. As the artists perform, a live public vote remains open throughout the show, determining which artist will go home each week. The winner of The Voice will receive the grand prize of a recording contract with Universal Music Australia and $100,000 in cash. The Voice Australia is filmed at Fox Studios in Sydney and produced by ITV Studios on behalf of Channel Nine.